Daniel Tiger’s Neighborhood has been a fan favorite for kids and adults alike since 2012. This animated children’s series is based on the Neighborhood of Make-Believe from Mister Rogers’ Neighborhood. 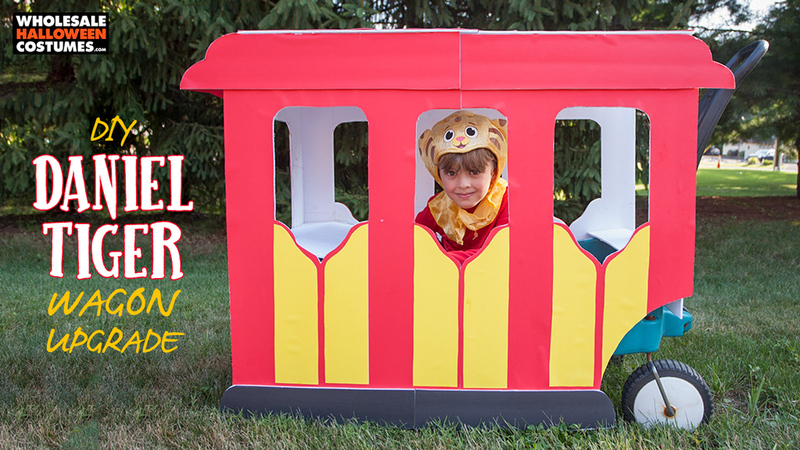 If your little one is looking to take a trip to hang out with Daniel Tiger and his animal friends, they need to do it in style. 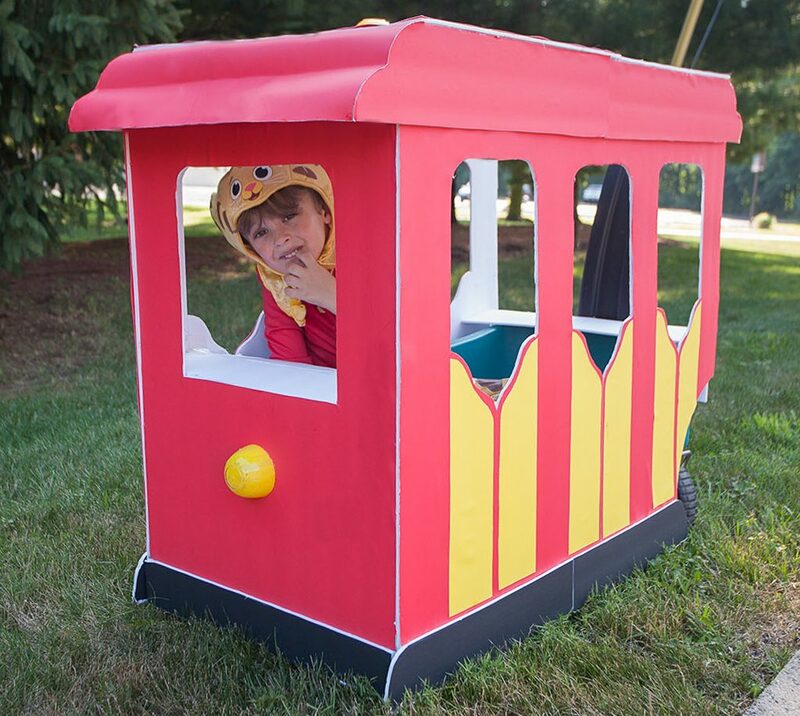 Hop on the trolley this Halloween and let their imaginations run wild! This project was designed to fit a “step 2” wagon. You can modify the measurements of the pieces to fit whatever wagon you might be using. The foam boards are from the dollar store so this upgrade is pretty inexpensive. Step 1. 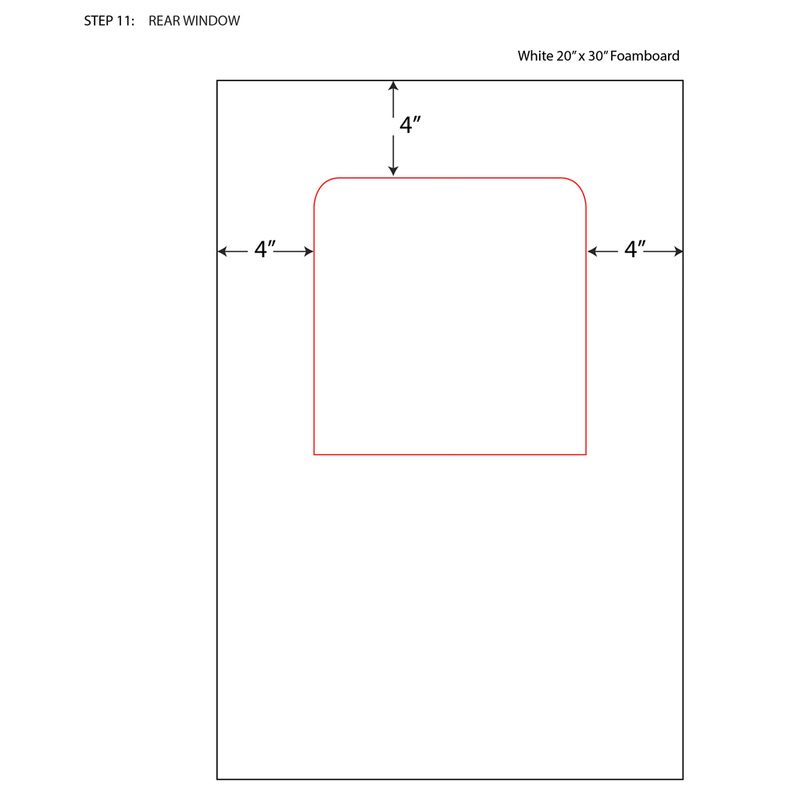 Use the window template to trace 1 and 1/2 windows on a piece of white foam board. Refer to the diagram of “step one” for placement. Step 2. Cut out the windows with the craft knife. Spray the cut panel with the spray glue. Adhere the panel to a sheet of red posterboard. The foamboard panel will be slightly larger than the posterboard, so leave the uncovered edge toward the bottom of the panel, as shown. Step 4. Use strips of white foam board, the length of the seams, by 3” wide, to secure the two panels together on the backside. Step 5. On a piece of yellow posterboard, trace the door template three times in one direction. Flip the template and trace it three more times in the opposite direction. Cut out the pieces. Step 6. Use the spray adhesive to attach the door pieces, making sure to spray the correct side of each door piece so that the pieces mirror each other. Step 7. 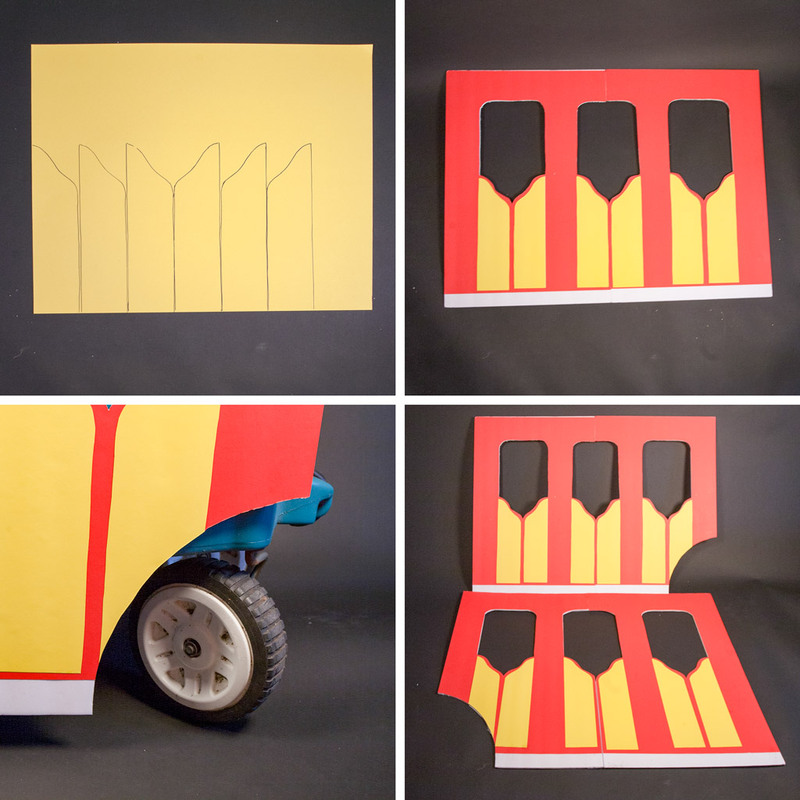 Hold the panel up against the side of the wagon, cut a notch at the front of the trolley to allow room for the wheels of the wagon to turn freely. Step 8. Repeat steps 1-7 to complete the second side of the trolley. Make sure to notch the wheel opening in the opposite direction as the first panel. Step 9. On black foam board, trace the template for the bottom trim, 4 times. Cut out the pieces. Step 10. Hot glue 2 of the base pieces on each side of the trolley, covering up any of the exposed white foamboard. Step 11. Follow the measurements in the diagram for “Step 11”. Using the spray glue, adhere the panel to a sheet of red posterboard. The foamboard panel will be slightly larger than the posterboard, so leave the uncovered edge toward the bottom of the panel, as shown. Trim the excess poster board. Step 12. Glue the sides of the wagon to the back panel, as shown. Cut a piece of black foam core 10” x 3” and attach it to the base of the back panel, covering up any of the exposed white foamboard. Step 13. To lift and hold the trolley up on the wagon, so it doesn’t drag on the ground, you need to add cross pieces inside. Cut a 6” x 20” piece of white foam board. 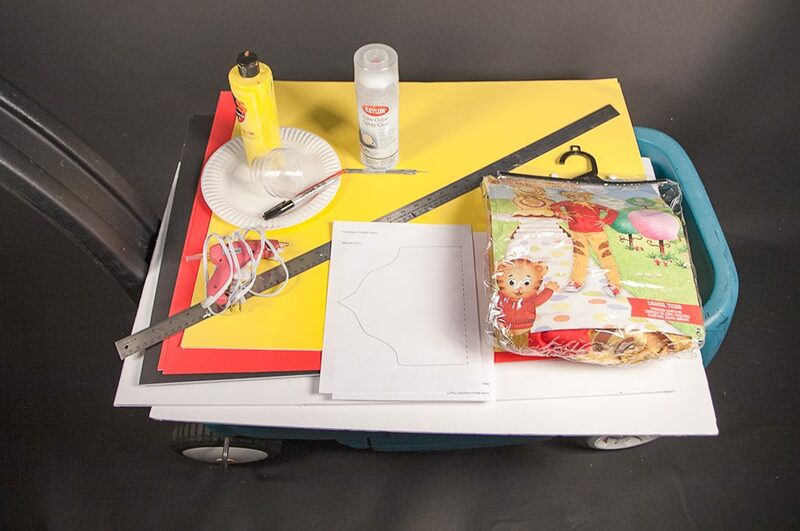 Glue the piece inside the back of the trolley, under the window and against the sides, so that it rests on the wagon. Step 14. Cut a 3” x 20” piece of white foam board. Glue the piece inside the front of the trolley, so the piece sits on the wagon, and the trolley looks level front to back. Step 15. Cut a second 3” x 20” piece of white foam board. Glue the piece inside the front of the trolley, connecting it to the piece from step 14 and against the sides of the trolley. Step 16. 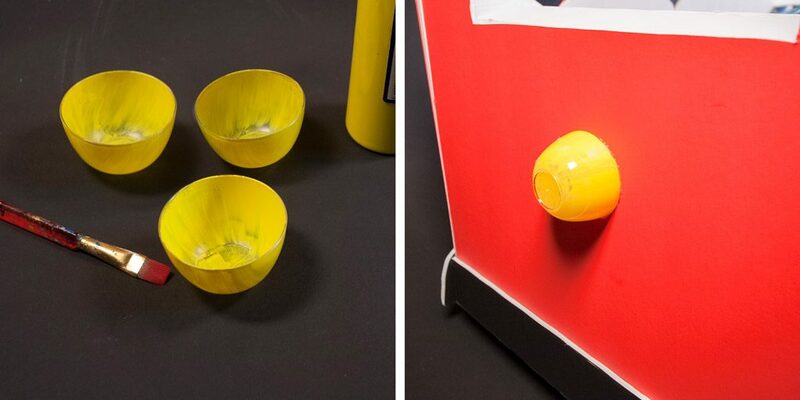 Paint the inside of 3 small plastic bowls yellow. Set aside to dry. Step 17. Glue one yellow bowl to the center of the back panel. Step 18. On white foamboard, trace the template for the roof trim 4 times. 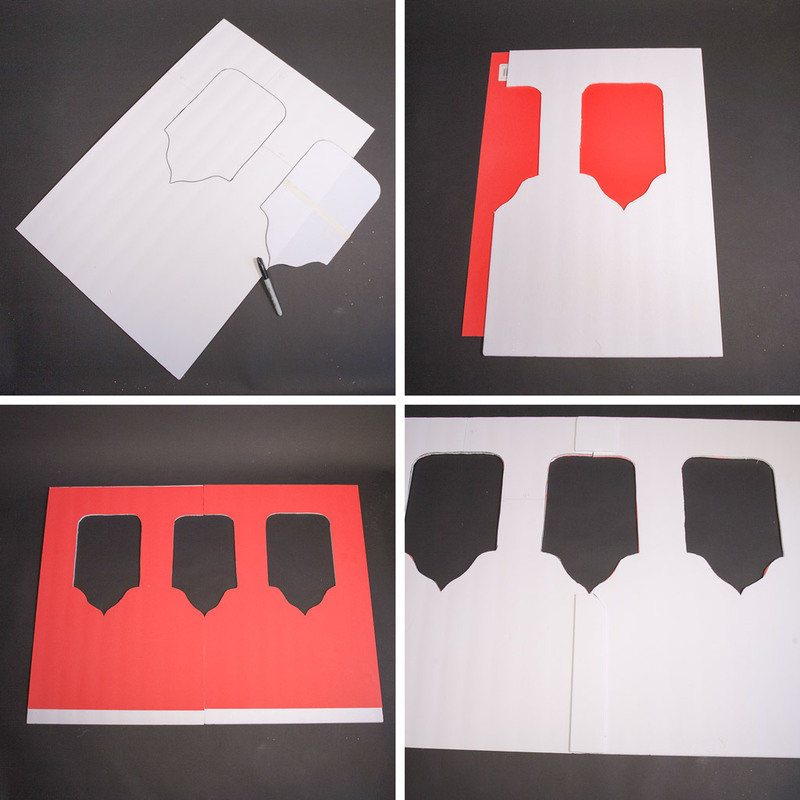 Attach the pieces to the red posterboard and cut out. Step 19. Glue the roof pieces to the top of the trolley on both sides. Step 20. 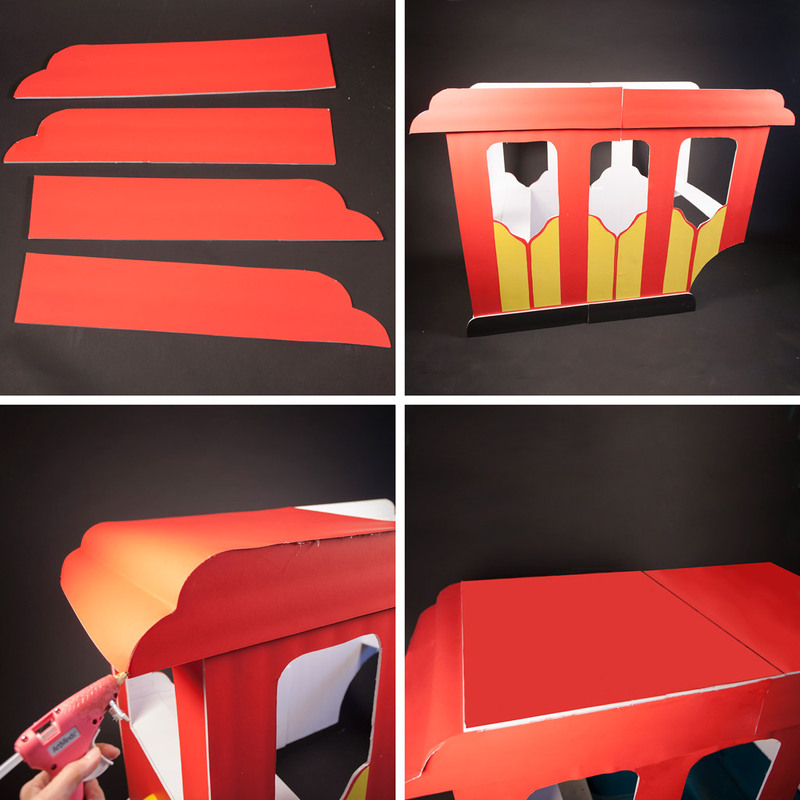 To create the curved roof of the trolley, use a piece of red posterboard and wrap it gently over the rear roof panels. 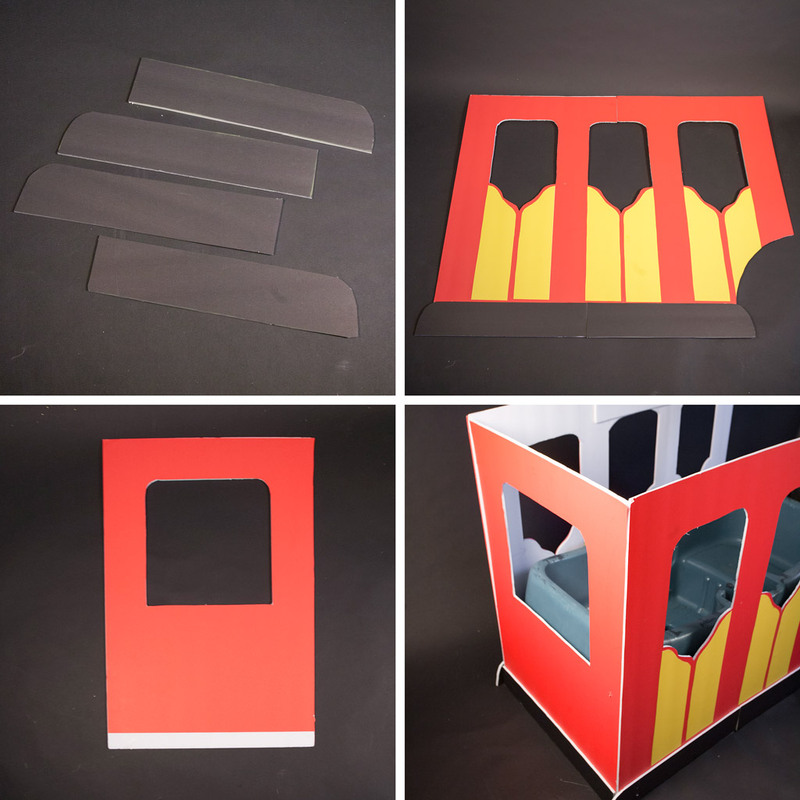 As you start to wrap the posterboard, fold and crease the posterboard to help hold the shape of the roof. Hot glue the poster board in place, and trim off any posterboard that overhangs the sides of the trolley. Step 21. The posterboard is not rigid enough to complete the roof. 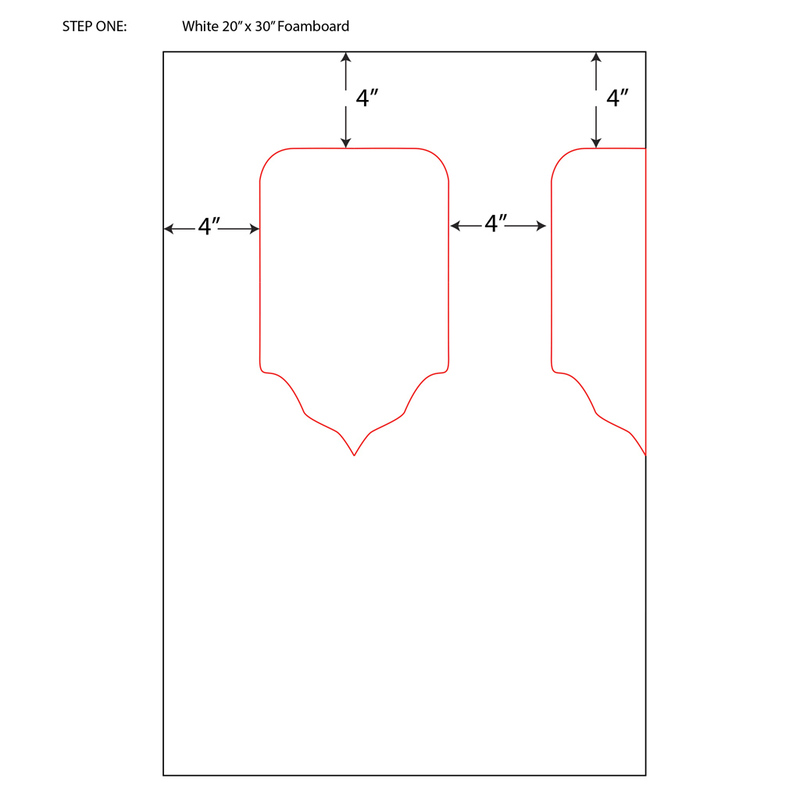 Cut out 2 pieces of white foam board 20” x 20” each. Cover with the red posterboard and trim the excess posterboard. Glue the 2 pieces together across the top of the trolley, overlapping the posterboard from step 20. Step 22. To finish the trolley glue the remaining 2 yellow cups on the top of the trolley. The kids can climb in from the front end by the handle, or the whole trolley is light enough to lift up and down off the wagon. There you have it! 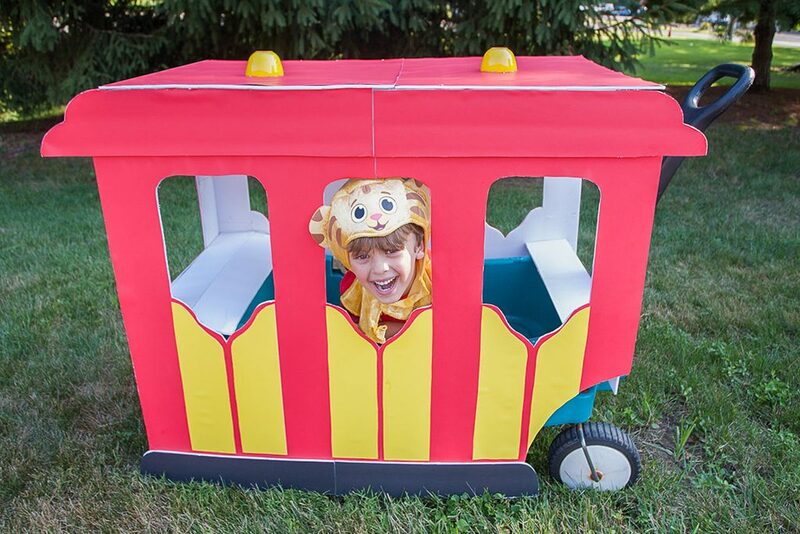 A trolley wagon fit to cruise the streets of Daniel Tiger’s Neighborhood. It’s the perfect way to cart around your kid and their candy this Halloween, so get to DIYing now. 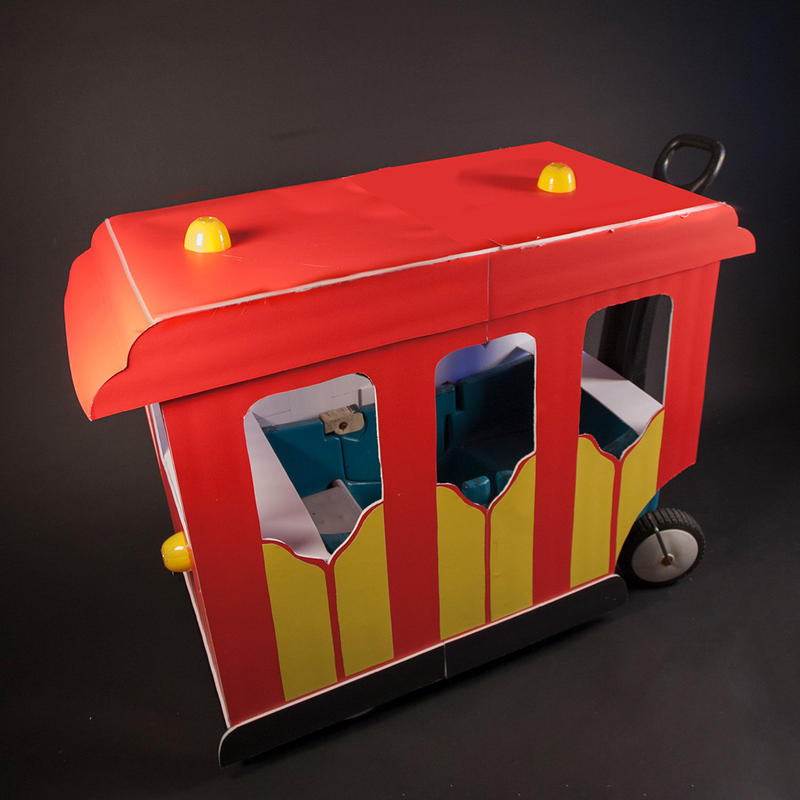 If you recreate this wagon upgrade, we’d love to see your finished project! 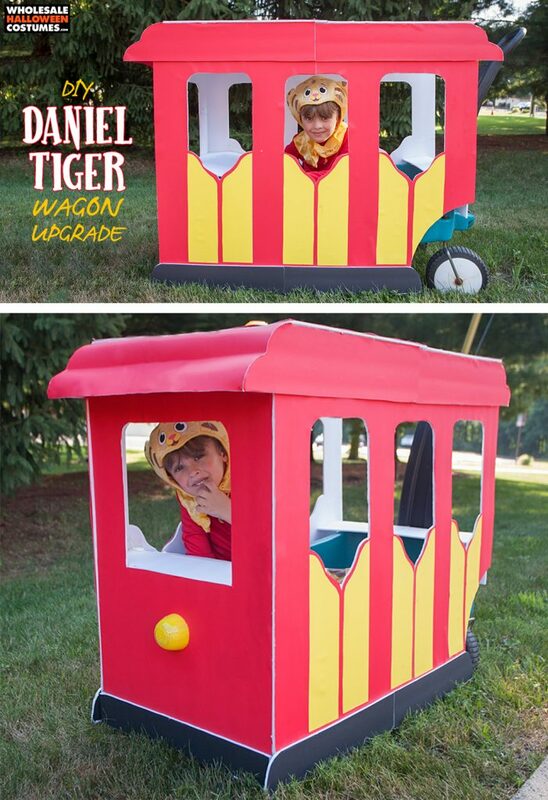 Share pics of your Daniel Tiger Trolley wagon with us on Facebook, Twitter, or Instagram! Connect with us on Pinterest too!